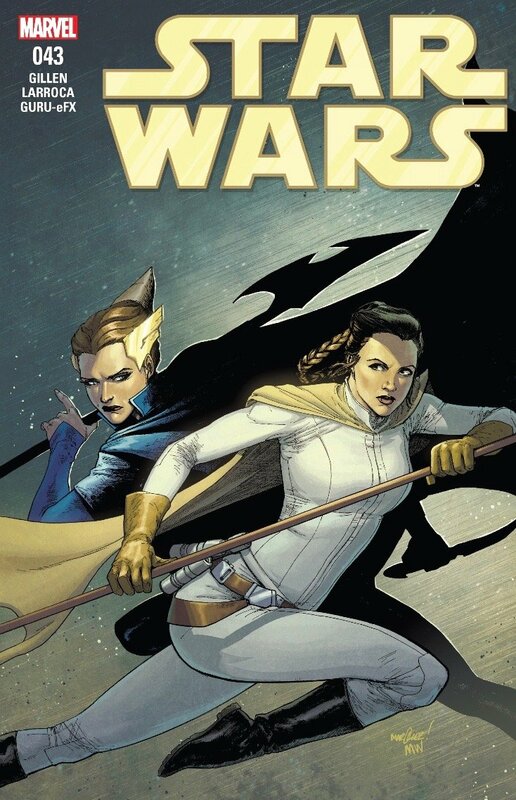 Discussion in 'Star Wars: Books & Comics + Legends' started by SWNN Probe, Feb 8, 2018. Yup, that's about how I suspected the first moments of Leia and Queen Trios' meeting would go. Only Leia's left-hook was thrown at the request of Trios, after she whispered it to the princess. I don't think Leia needed much convincing in the matter. Once Trios has been subdued, Leia takes a blaster to the security camera in the room. Then she realizes what's going on – Trios helped get the plans of the Leviathan the Rebels. Trios is working against the Empire. If you've been following my reviews of this arc, you'll remember this was a suspicion of mine, as well as a few other folks I know who've been enjoying this arc. Nicely played, Trios, and thank you for making me feel much more clever than I am. Is it just me, or is this frame of Han looking a bit 'Ehrenreich'-ish? Maybe that's because I've watched the new Solo trailer too many times in the last few days, but I wondered if series artist Salvador Larroca added a bit of the younger actor in with his tracing...I mean drawing...of Harrison Ford. Sorry, Salvador, it's my last chance to give you a hard time about your style, so I couldn't resist. Back to 'The Ashes of Jedha', Han and the Partisans have made it to the bridge only to find it empty. The previous two occupants are dealing with a fight of their own. Does Luke Skywalker taking on a tough-guy, cyborg Imperial commander with an axe limb that can withstand the blow of a lightsaber sound cool to you? Me too. Only problem is the frames of this battle are extremely tight and claustrophobic, as I've complained about awfully cool sounding action sequences in previous issues of this arc. The above frame is about as good a look we get of Luke and Commander Kanchar. I know we readers are expected to use our imaginations and meet the authors and artists in the middle, but in a medium as reliant on visuals as comic books are, I feel like we deserved a little more. Kanchar is giving Luke a run for his money. Not only does his cybernetic limb stand toe-to-toe with a lightsaber, it also doubles as a flame thrower. Luke does what most people would do and what is friend Obi-Wan Kenobi wisely advised upon the Death Star...run. Queen Trios has been planning this all along. If you remember her history, Vader and the Empire dismantled her royal house, murdered her father and brought the proud planet of Sho-Torun to it's knees. Trios mentions Vader presenting her with a piece of Alderaan, post Death Star, as a reminder of what happens to planets that go against the Empire. It didn't frighten Trios, it woke her up. Since then, she's been planning on how best to sabotage the Empire, while appearing to remain loyal so her people will be protected. Sho-Torun has been stashing away much of it's ore and resources, while still fulfilling the Empire's demands, and Trios is ready to turn them over to Leia and the Rebel Alliance. If that weren't enough, Trios also offers to be a spy for the Alliance. I love that they've progressed Trios' story to this point. It's not only a satisfying addition to her motivation, but it also has great potential for her future appearances. Leia's also pretty happy with this arrangement. Kanchar has caught up with Luke on a landing pad within the Leviathan. The Imperial Commander is quite confident he's got Luke cornered, until the Jedi hopeful exploits the cybernetic components. Luke uses an ion torpedo. Just like that Star Destroyer rendered useless above Hoth in TESB from a surface cannon, Luke turns technology against Kanchar. Taking a cue from his sister, Luke gets in a punch of his own and leaves Kanchar disabled and unconscious as he goes to find what's become of Leia and Han. Luke stumbles upon Leia and Trios, just as the princess was leaving. Trios agrees to hang back and stall any Stormtroopers that may be following. They leave to rejoin the Partisans and the Alliance, with a lot more hope. To crash the Leviathan, someone has to stay behind to keep the Imperials from correcting the crash course. Brave and selfless, Ubin volunteers to stay behind with the Partisans, but Han won't have it. In the short time they've been fighting the Empire together, Ubin's offered to put herself on the line several times, and Han's been the voice that talks her back. Not much is said between them here, other than he figures out another way to crash the Leviathan and orders Ubin to help him pilot the Falcon. 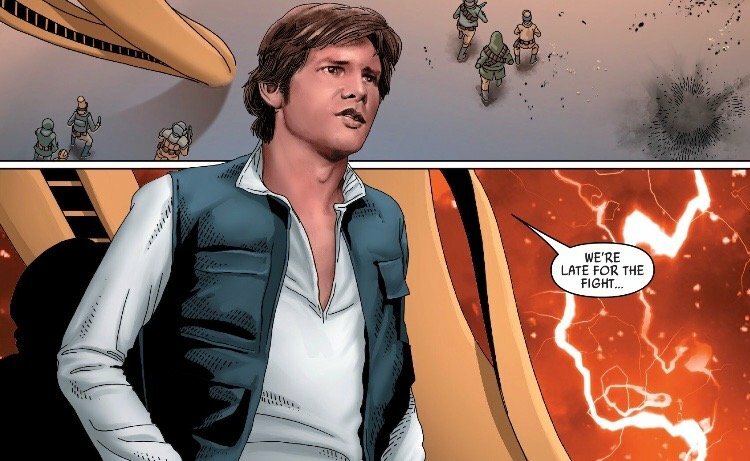 In the past issues, Han's reminded Ubin her heroism deserves more time in this fight against the Empire than to go up in flames of self-sacrifice. There's more to sacrifice than death, and though he doesn't say it, I can't help that's what Han's thinking about her. Han and Ubin pilot the Falcon to the bridge and blast the controls. They are just in time to save Leia, Luke, and the rest of the Partisans and Rebels. As Trios runs distraction for them, diverting Stormtroopers, she says, 'Good luck, Rebels'. Our heroes escape the Leviathan as it goes plunging into the abyss of Jedha. Commander Kanchar is certainly more docile after his defeat. He actually apologizes to Queen Trios for the loss of the Leviathan. The commander is probably not too thrilled about his debriefing with Imperial brass, assuming the Emperor and Vader most likely had a close eye on his operation. The destruction of the Leviathan serves as a perfect cover for Trios' new role as Rebel Alliance informant. After the destruction of one of her home world's mightiest vessels, she's sure it will solidify her perceived allegiance to the Empire. I'm excited to see where Trios goes from here and how her role in the Rebel Alliance and eventually the Republic, assuming she survives post-ROTJ. I'm happy writer Kieron Gillen brought her into this arc. With the Imperial threat temporarily thwarted, Benthic and the Partisans vow to stay behind until Jedha finally comes undone. Saw's legacy lives on through him and the Partisans, who have found a new ally in the Rebel Alliance. Now that we know the Partisans are out there, it would be great to see them pop-up as we move closer to TESB. Han gives Ubin a medal for her bravery, and I assume she's staying behind with the Partisans. If Gillen continues to helm this titular Marvel book, don't be surprised if you see her pop-up again. Our heroes fly off into the galaxy, with refreshed hope and purpose, to continue their fight against the Empire. I'm very satisfied with this final issue in 'The Ashes of Jedha'. 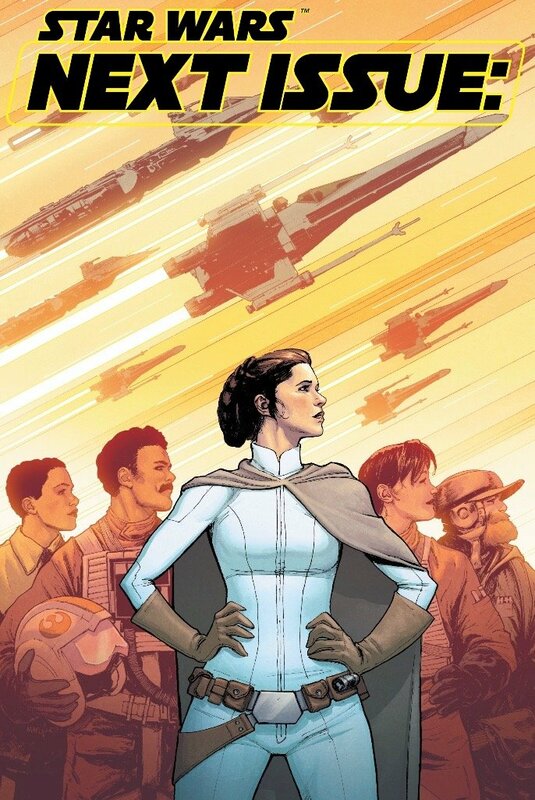 This arc is a solid start for Kieron Gillen and I get the sense the stories he will be writing about Leia, Luke, and Han will tell of their fighting on the frontlines. Remember, the Rebel Alliance still has no central base. They are evading the Imperial Fleet, looking to find their footing, and it seems like they are a long way from settling on Hoth. There's a lot of story left to tell until an Imperial probe droid crashes on the surface of Hoth. If this tale about Jedha is any measure, we comic book fans should be able to sit back and enjoy the ride. Yup, that's about how I suspected the first moments of Leia and Queen Trios' meeting would go. Only Leia's left-hook was thrown at the request of Trios, after she whispered it to the princess. I don't think Leia needed much convincing in the matter. 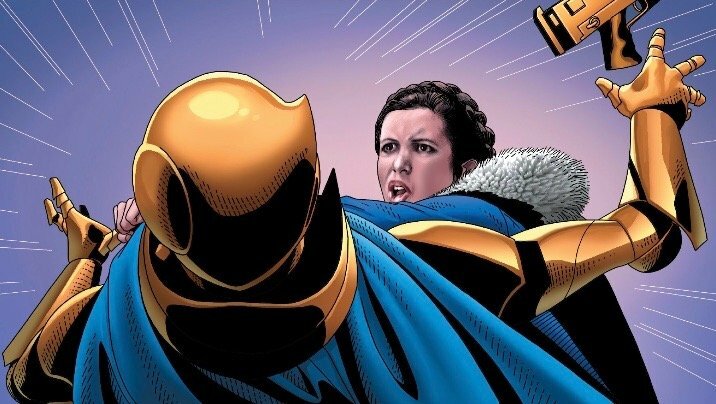 BWAHAHAHAHA The Princess is feisty and she definitely has a good punch (asks Dr Aphra about it). Then she realizes what's going on – Trios helped get the plans of the Leviathan the Rebels. Trios is working against the Empire. If you've been following my reviews of this arc, you'll remember this was a suspicion of mine, as well as a few other folks I know who've been enjoying this arc. Nicely played, Trios, and thank you for making me feel much more clever than I am. I'm seriously enjoying how they are tying all loose ends from Annual issues from the different comic series. We had a great tie-in from the Star Wars Annual into the Rebel Jail story arc, and this one with Queen Trios from the Darth Vader Annual is not the exception. Of course it opens the door to see more connections ahead (Pash Davane, etc) which I am really looking forward to read and discover. Is it just me, or is this frame of Han looking a bit 'Ehrenreich'-ish? Oh dear. Yeah it sort of looks like. Luke does what most people would do and what is friend Obi-Wan Kenobi wisely advised upon the Death Star...run. Awww young Luke. Love this fella! Queen Trios has been planning this all along. If you remember her history, Vader and the Empire dismantled her royal house, murdered her father and brought the proud planet of Sho-Torun to it's knees. Trios mentions Vader presenting her with a piece of Alderaan, post Death Star, as a reminder of what happens to planets that go against the Empire. It didn't frighten Trios, it woke her up. Since then, she's been planning on how best to sabotage the Empire, while appearing to remain loyal so her people will be protected. Sho-Torun has been stashing away much of it's ore and resources, while still fulfilling the Empire's demands, and Trios is ready to turn them over to Leia and the Rebel Alliance. If that weren't enough, Trios also offers to be a spy for the Alliance. I love that they've progressed Trios' story to this point. It's not only a satisfying addition to her motivation, but it also has great potential for her future appearances. Leia's also pretty happy with this arrangement. That makes a lot of sense when we see the status of the Rebel Alliance in TESB. Of course they have received funds and forged new alliances that give them new sources of supply to keep fighting the Empire. 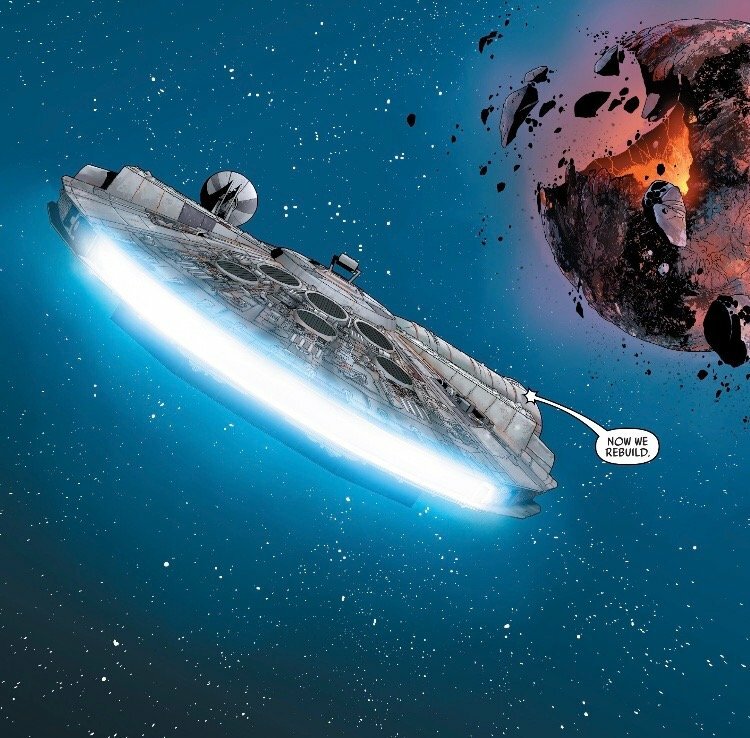 In the past issues, Han's reminded Ubin her heroism deserves more time in this fight against the Empire than to go up in flames of self-sacrifice. There's more to sacrifice than death, and though he doesn't say it, I can't help that's what Han's thinking about her. I think about Starkiller Base and feel like crying. Especially when there is a passage from the ANH junior novelisation when young Han witnesses Obi-Wan's sacrifice and wonders if he would do the same. Sigh. "wonder at our piloting skills" hahahhaa good Lord. 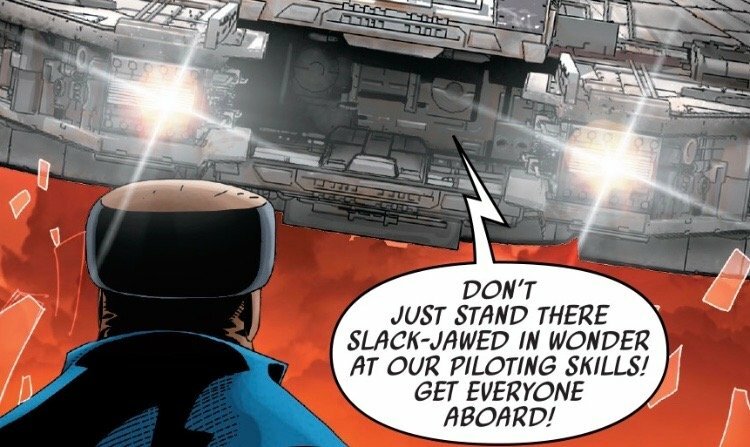 Can we please have in future issues more piloting banter between Han and the one some consider a better pilot, a little known green female Twi'lek that goes under the name of General Hera freaking Syndulla?? As Trios runs distraction for them, diverting Stormtroopers, she says, 'Good luck, Rebels'. Our heroes escape the Leviathan as it goes plunging into the abyss of Jedha. Was I the only one who thought about Vice Admiral Holdo when she said that? The destruction of the Leviathan serves as a perfect cover for Trios' new role as Rebel Alliance informant. After the destruction of one of her home world's mightiest vessels, she's sure it will solidify her perceived allegiance to the Empire. 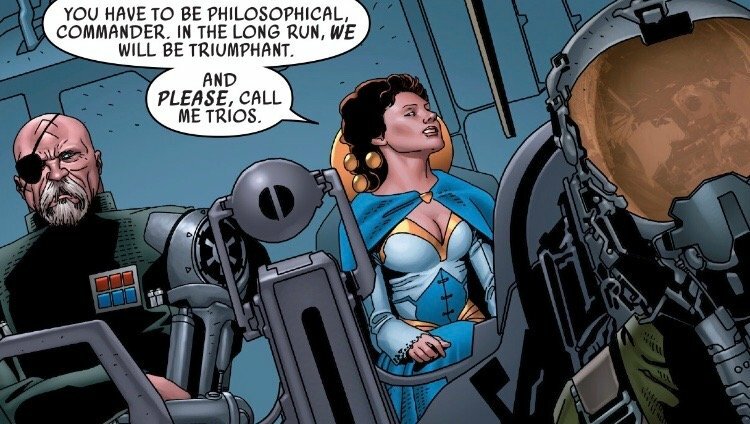 I'm excited to see where Trios goes from here and how her role in the Rebel Alliance and eventually the Republic, assuming she survives post-ROTJ. I'm happy writer Kieron Gillen brought her into this arc. Seriously, looking forward where the space Emily Blunt (lol) goes from here, it will be really interesting if we can see more interactions between her, the Empire and the Rebels. Was I the only one who thought of TLJ when I saw this frame and realised with sadness we never saw the trio again together in the MF cockpit? BTW I think Larroca is a nice guy but at some point it's a tad distracting to see the facial expressions of the characters and immediately identify which movie scene that face was "inspired" from? It's amusing for me at some point but for others might become distracting and annoying. (Just for reference, this shot features Luke from the Throne Room (ANH), Leia rescuing Han at Jabba's palace (ROTJ) and Han at the MF cockpit teasing Luke about Leia (ANH) lol). I could be mistaken, but it looks like Luke on Endor celebration(ROTJ). I don't remember Luke smiling in the Throne Room like that. Here is the evidence, Your Honor. My bad M'lady thought you meant ROTJ throne room, got confused with the ANH throne room.